The premiere of Big Blue Door’s spring performance groups Tornado Warning and Boho Baby! Plus The Administration! Big Blue Door’s spring performance groups Tornado Warning and Boho Baby! Plus The Administration! Final performance of Big Blue Door’s spring performance groups Tornado Warning and Boho Baby! In a brand-new venue! Plus The Administration! Members of Big Blue Door’s spring performance groups join together for special show! Big Blue Door’s winter classes present a marathon showcase of Telling True Stories at 1:30pm, Improv I at 3pm, and Improv III at 4pm in Big Blue Door’s upstairs studio! Big Blue Door winter performance groups Feminine Hijinks, Just Cause, and The Administration welcome you to their final show at the Belmont Arts Collaborative! Big Blue Door winter performance groups Feminine Hijinks, Just Cause, and The Administration perform at The Bridge! Featuring Big Blue Door winter performance groups Feminine Hijinks, Just Cause, and The Administration in Big Blue Door’s home studio! Big Blue Door winter performance groups Feminine Hijinks, Just Cause, and The Administration kick off their winter run at the Belmont Arts Collaborative! Host Nauder Namaky presents final autumn Bridge show with opening act, Product Placement! Special early show with Latte Farm, Product Placement, and The Administration! 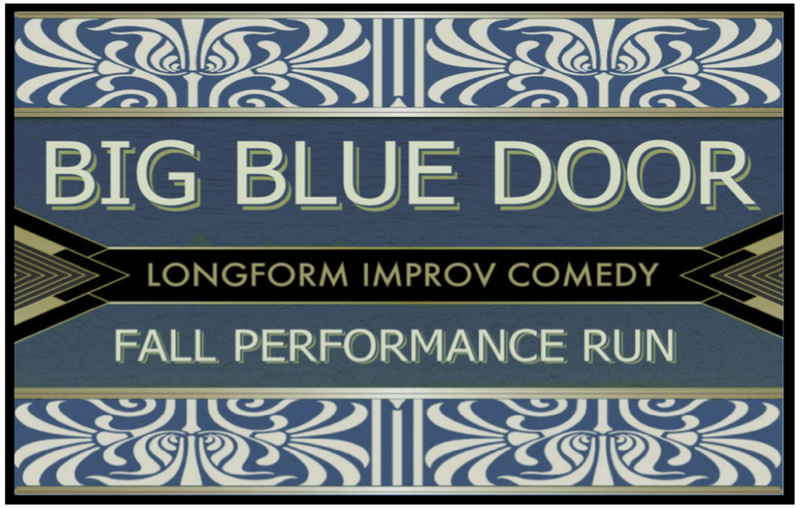 Graduates of Big Blue Door’s Improv 2 course perform just for you! Featuring Big Blue Door’s fall performance ensembles, Latte Farm and Product Placement, plus The Administration! Big Blue Door fall performance groups come to the Belmont Arts Collaborative! Hosts Jessie Conover and Nauder Namaky present a changing monthly show! Featuring the debut of Big Blue Door’s fall performance ensembles! Hosts Jessie Conover and Nauder Namaky kick of Big Blue Door’s seventh season with a night of great improv comedy! McGuffey Art Centers features Big Blue Door demonstrating how a show is rehearsed and performed. Join Big Blue Door as we return to Belmont Arts Collaborative with our final summer show of the year! BBD AT BAC: IMPROV AT BELMONT ARTS COLLABORATIVE! Join Big Blue Door as we return to Belmont Arts Collaborative with our summer performance groups! Special early show to start your summer night right! Featuring the debut of Big Blue Door’s summer performance ensembles! Big Blue Door improvisers perform with The Fire Tigers! Big Blue Door doesn’t have any shows scheduled for most of June but our friend Larry Goldstein is producing an improv festival of sorts that will include veteran ensemble Feminine Hijinks. It’s called ‘An Evening of Improv,” at Belmonts Arts Collaborative. 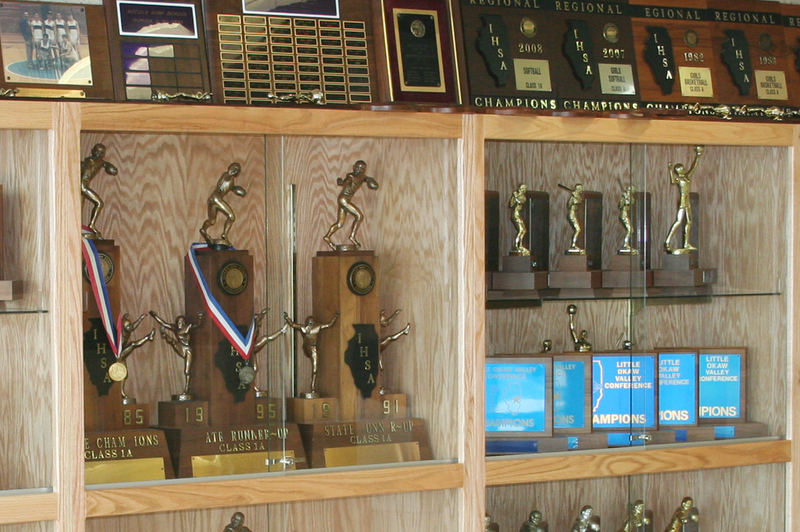 Other acts include Hamner Improv Theatre and Playback Theater. Here’s the facebook event. We don’t know the ticket price. Graduates of Big Blue Door’s latest Improv III: The Harold course perform just for you! Eight veteran Big Blue Door improvisers invite you into their longform improv comedy show of stories and scenes! Big Blue Door trio Nauder Namaky, Brian Weisbrod, and Joel Jones plus guests bring longform improv comedy to Studio Ix for the first time! FIRST FRIDAY IMPROV: FEMININE HIJINKS & BUNCH! The first Friday of April will feature the final performance by Big Blue Door’s winter teams Feminine Hijinks and Bunch! Plus The Administration! Graduates of Big Blue Door’s latest Improv II: Cuts & Callbacks course share a performance form called living room plus a montage! Join Big Blue Door as we return to Belmont Arts Collaborative with our winter performance groups, Feminine Hijinks & Bunch, plus The Administration! Graduates of Big Blue Door’s Telling True Stories course share some amazing stories! Big Blue Door’s all-female improv ensemble Feminine Hijinks perform as part of Women’s History month at The Bridge! The first Friday of March will feature Big Blue Door’s winter performance teams Feminine Hijinks and Bunch! Plus The Administration! BIG BLUE DOOR IMPROV NIGHT FAREWELL PERFORMANCE! For 3+ years Big Blue Door’s signature show has been our monthly improv show on the third Thursday of every month at Cville Coffee. Join us for our farewell show! Brian, Nauder, & friends bring back their hilarious yearly exploration of romantic failure to make you feel better about your life! This is an annual Charlottesville favorite from great performers who want to be your funny valentine! The first Friday of February will feature the premiere of Big Blue Door’s winter performance run with the return of Feminine Hijinks plus new group Bunch! The third Thursday of every month Big Blue Door creates hilarious longform improv with an ever-changing roster of styles and groups. Our first show of 2018 features the return of Dish! The third Thursday of every month Big Blue Door creates hilarious longform improv with an ever-changing roster of styles and groups. Our December show features a special holiday edition of Dish! The third Thursday of every month Big Blue Door creates hilarious longform improv with an ever-changing roster of styles and groups. November features the final performances of our fall improv ensembles Feminine Hijinks & Suburban Dictionary! The third Thursday of every month Big Blue Door creates hilarious longform improv with an ever-changing roster of styles and groups. October features fall improv ensembles Feminine Hijinks & Suburban Dictionary! Check out this free storytelling showcase from Big Blue Door’s True Stories class! The third Thursday of every month Big Blue Door creates hilarious longform improv with an ever-changing roster of styles and groups. September features the premiere of Big Blue Door’s fall performance ensembles! A pick-up assembly of Charlottesville’s best and funniest improvisers share the dirt and give you a chance to do the same. Bring your personal complaints, confessions, and revelations! The third Thursday of every month Big Blue Door creates hilarious longform improv with an ever-changing roster of styles and groups at Cville Coffee. August features Big Blue Door’s last summer show, with a pick up group of Big Blue Door newcomers and veterans! Big Blue Door’s summer performance groups Dancing Pilots and Compact Fun perform at at our awesome new digs. The third Thursday of every month Big Blue Door creates hilarious longform improv with an ever-changing roster of styles and groups at Cville Coffee. July features Big Blue Door’s summer improv ensembles Dancing Pilots and Compact Fun. Big Blue Door visits the Front Porch, Charlottesville’s awesome roots music school on Water Street for the final time (at least for awhile) with Big Blue Door’s summer harold teams. Colorblind Astronauts and Lemon Cello perform for their final time, which is also the first time for Big Blue Door at Belmont Arts Collaborative. 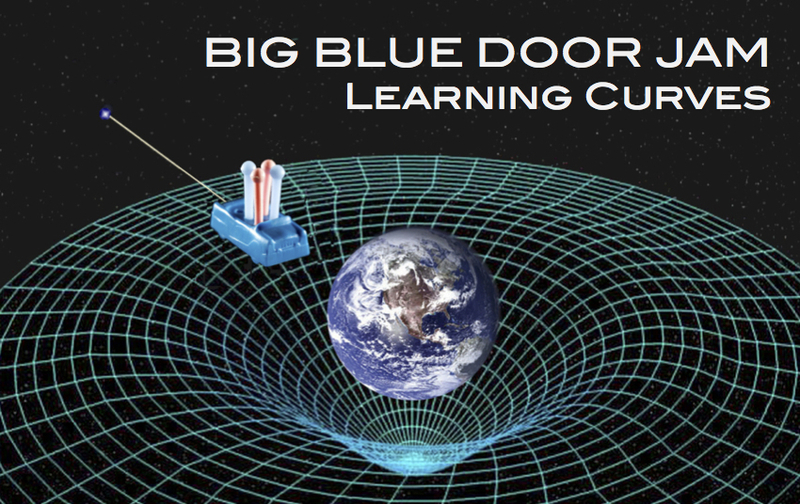 Plus special guests, the Big Blue Door Master Class! On the fourth Saturdays of every month from January till June Big Blue Door visits the Front Porch, Charlottesville’s awesome roots music school on Water Street. April will feature Big Blue Door’s spring harold teams, Lemon Cello & Colorblind Astronauts. The third Thursday of every month Big Blue Door creates hilarious longform improv with an ever-changing roster of styles and groups. April’s improv night features Big Blue Door’s spring performance ensembles, Lemon Cello & Colorblind Astronauts! Graduates of Big Blue Door’s Improv 2 and Telling True Stories courses perform just for you! Big Blue Door’s spring improv ensembles Lemon Cello and Colorblind Astronauts and joined by Big Blue Door’s instructors performing together as The Administration. The third Thursday of every month Big Blue Door creates hilarious longform improv with an ever-changing roster of styles and groups. 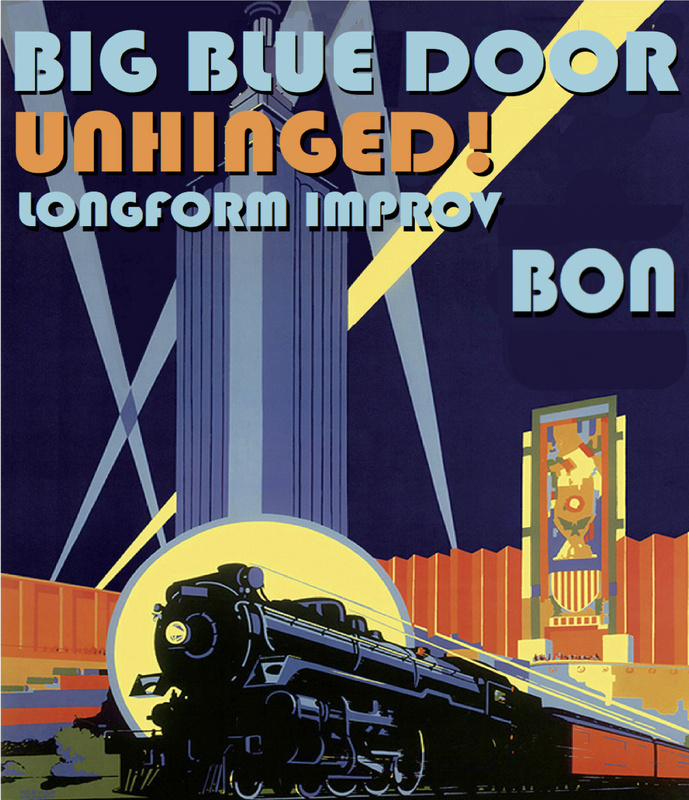 April’s improv night features the debut of Big Blue Door’s spring performance ensembles! On the fourth Saturdays of every month from January till June Big Blue Door visits the Front Porch, Charlottesville’s awesome roots music school on Water Street. March will feature The Experience, a raw, real, and hilarious mixture of true stories and improv comedy like nothing Charlottesville has experienced before! 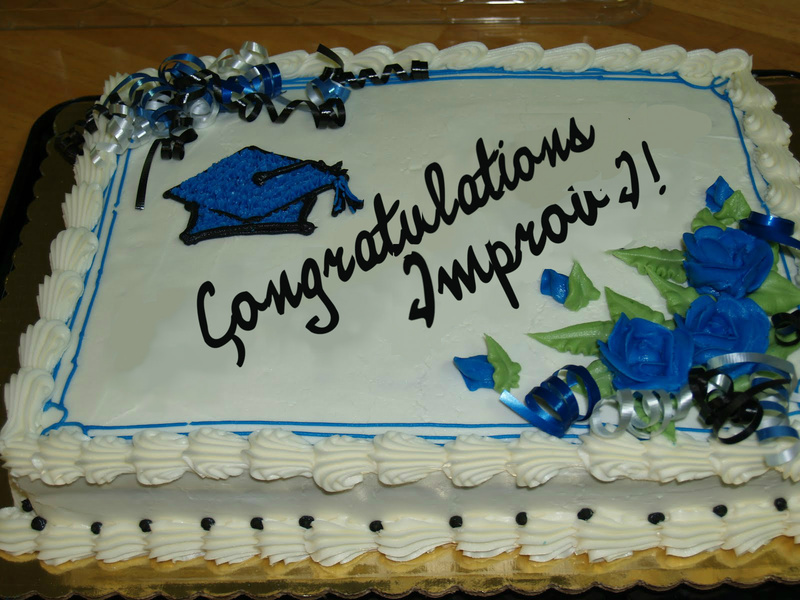 Graduates of Big Blue Door’s Improv I course perform just for you! The third Thursday of every month Big Blue Door creates hilarious longform improv with an ever-changing roster of styles and groups. 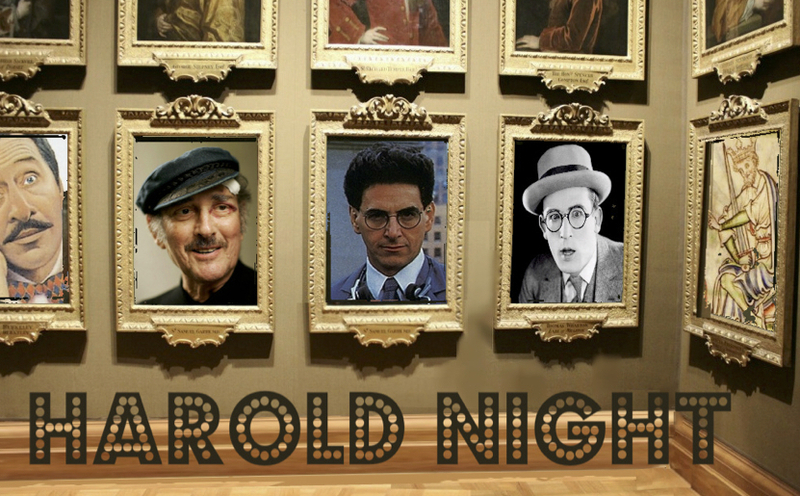 February’s improv night features Big Blue Door’s winter harold teams, Mr Mammals & Half-Price Candy. Featuring true stories and great comedy improv with Nauder Namaky, Brian Weisbrod, Larry Goldstein, Deborah Arenstein, and Finn Mehigan plus guest storytellers Ryan & Melissa Wender! Check out this free true stories showcase from Big Blue Door’s current advanced class! The first Friday of March will feature performance by our winter Harold groups, Mr Mammals & Half-Price Candy. On the fourth Saturdays of every month from January till June Big Blue Door visits the Front Porch, Charlottesville’s awesome roots music school on Water Street. February will feature Big Blue Door’s winter harold teams, Mr Mammals & Half-Price Candy. The first Friday of February will feature the first performance by our winter Harold groups, Mr Mammals & Half-Price Candy. On the fourth Saturdays of every month from January till June Big Blue Door visits the Front Porch, Charlottesville’s awesome roots music school on Water Street. January will feature The Experience, a raw, real, and hilarious mixture of true stories and improv comedy like nothing Charlottesville has experienced before! The third Thursday of every month Big Blue Door creates hilarious longform improv with an ever-changing roster of styles and groups. December’s improv night features a one-night only combination of Big Blue Door improv veterans and newcomers! The third Thursday of every month Big Blue Door creates hilarious longform improv with an ever-changing roster of styles and groups. Selected first Fridays at McGuffey Art Center feature new art openings downstairs at 530pm and improv upstairs at 7pm. 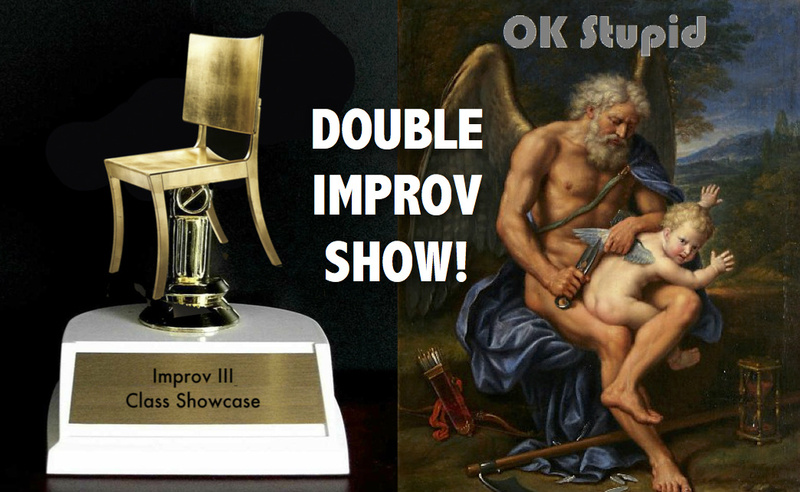 The art is free; the improv will set you back $5! The third Thursday of every month Big Blue Door creates hilarious longform improv with en ever-changing roster of styles and groups. September’s Improv Night features a full show by Big Blue Door teaching trio, The Administration! The first Friday of September will feature improv trio, The Administration. The third Thursday of every month Big Blue Door creates hilarious longform improv with en ever-changing roster of styles and groups. August’s Improv Night features a full show by Big Blue Door teaching trio, The Administration! Graduates of Big Blue Door’s Improv 2 and Telling True Stories share the fun! The third Thursday of every month Big Blue Door creates hilarious longform improv with en ever-changing roster of styles and groups. July’s Improv Night features the final performance of our summer ensembles The Bitter End and The Administration! The Bitter End and The Administration present a Special Summer Spectacular Saturday edition of Improv Night! 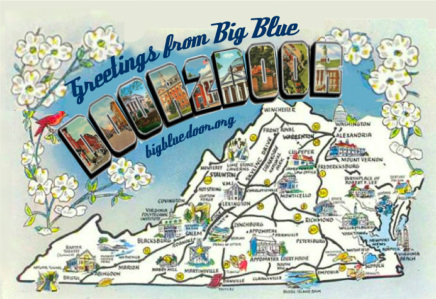 Big Blue Door’s summer ensembles hit the road to bring the Harold to Mudhouse in Crozet or a special free performance! The third Thursday of every month Big Blue Door creates hilarious longform improv with en ever-changing roster of styles and groups. June’s Improv Night features the premiere of our summer performance ensembles! The third Thursday of every month Big Blue Door creates hilarious longform improv with en ever-changing roster of styles and groups. May’s Improv Night features two awesome graduate ensembles presenting their class showcase! Final show of spring performance with The Echo and Short Term Analysis! Graduates of Big Blue Door’s Improv 1 share the fun! The first Friday of May will feature our spring performance groups The Echo and Short Term Analysis! The third Thursday of every month Big Blue Door creates hilarious longform improv with en ever-changing roster of styles and groups. April’s Improv Night features the debut of our spring performance series The Echo plus a special preview of Short Term Analysis. Celebrate April Fool’s with a special one-time-only performance of the True or False Show! Big Blue Door’s final winter improv performance with Sleepover and The Helix in our revamped studio! Check out Big Blue Door’s winter improv run with Sleepover and The Helix in our revamped studio! 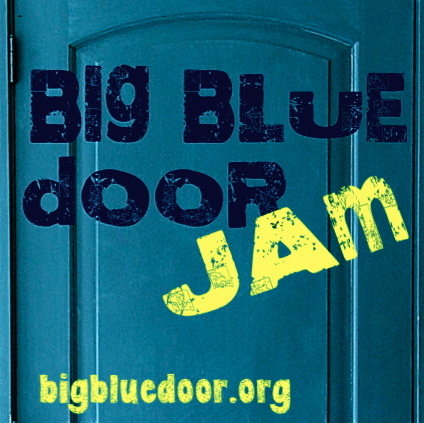 Veterans of Big Blue Door Jams and Slams have been getting together to swap stories weekly since early December. 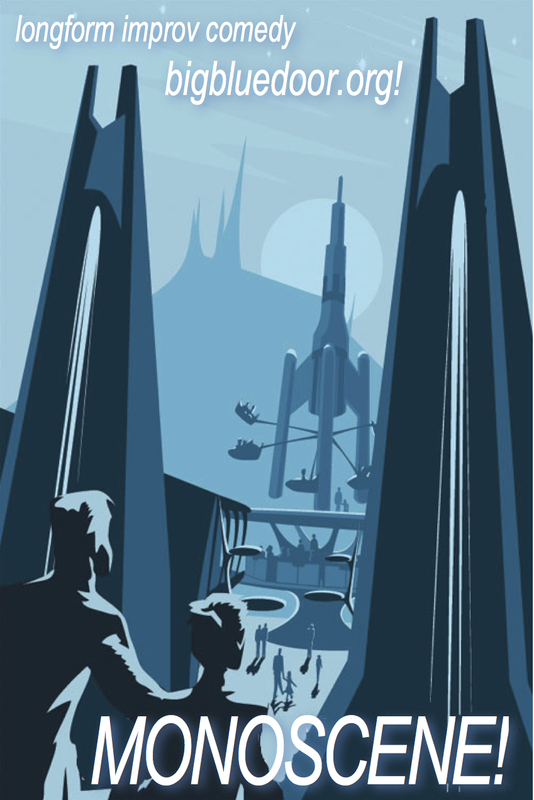 On the final Thursday of January they present some of their favorites. The third Thursday of every month Big Blue Door creates hilarious longform improv with en ever-changing roster of styles and groups. 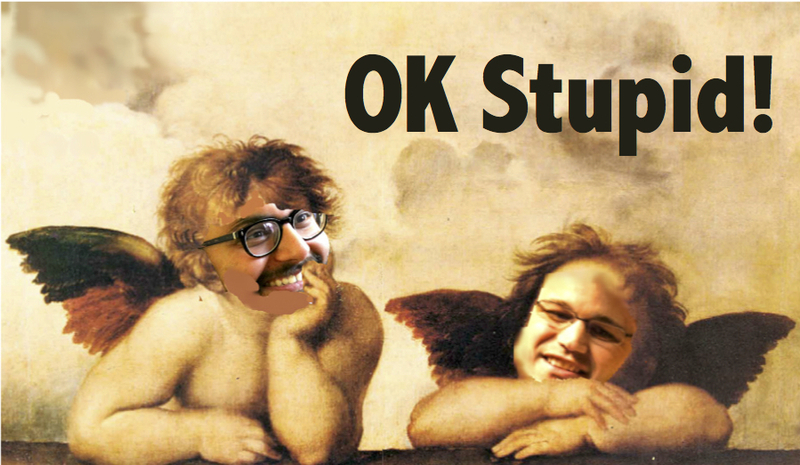 January Improv Night features OK Stupid hosting preview performances of Sleepover and The Helix! The third Thursday of every month Big Blue Door creates hilarious longform improv. December Improv Night features a special holiday presentation of OK Stupid with Brian Weisbrod, Nauder Namaky, and guests! The third Thursday of every month Big Blue Door creates hilarious longform improv. November Improv Night features the final show of our fall performance ensembles Catawampus and Dance Monkey! New Big Blue Door fall performance teams bring the Harold to Crozet Mudhouse! 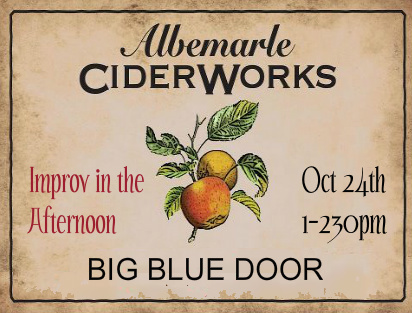 Big Blue Door’s fall performance groups hit the road to present a free 90-minute matinee show at Albemarle Cider Works! New Big Blue Door fall performance teams present a special First Fridays performance. New Big Blue Door fall performance teams debut. Hosted by OK Stupid. Big Blue Door veterans Brian Weisbrod and Nauder Namaky plus guests Max Hoecker and Joel Jones turn everyone’s miserable love lives into great improv comedy. Graduates of Big Blue Door’s summer Improv 3 course present the Harold, plus OK Stupid deconstructs bad love with hilarious improv comedy. Big Blue Door veterans Brian Weisbrod and Nauder Namaky and their guests turn everyone’s miserable love lives into great improv comedy. The last show of Big Blue Door’s summer harold run is the first official show as renting members of Studio 20 at McGuffey Art Center. Big Blue Door summer improv groups Plan A and Mogli Mogli de Brogli join together to perform the Harold and a Montage. Big Blue Door summer improv teams Plan A and Mogli Mogli de Brogli present two Harolds, a Montage, and more, inspired by audience suggestions. Big Blue Door unveils the teams for the upcoming Summer Harold Run. Performers present two Harolds, a Montage, and more, inspired by audience suggestions. This show is a preview for Big Blue Door’s upcoming Summer Harold Run, as performers before they have formed the summer teams, present two Harolds, a Montage, and more, inspired by audience suggestions. BIG BLUE DOOR: IMPROV NIGHT! Big Blue Door resident ensemble, The Placeholders, presents a night of improv featuring the monoscene, harold, and montage. Big Blue Door comes to the Main Street Annex for the first time with a triple-class showcase extravaganza, featuring graduates of our Telling True Stories course, plus Improv 2: Cuts & Callbacks, and Improv 3: The Harold. BIG BLUE DOOR: THE MONOSCENE! Big Blue Door resident ensemble, The Placeholders, feature the Monoscene, creating scenes inspired by audience suggestions of locations. Big Blue Door’s resident improv ensemble, The Placeholders, is proud to perform as part of PVCC’s monthly Final Fridays Improv Night! 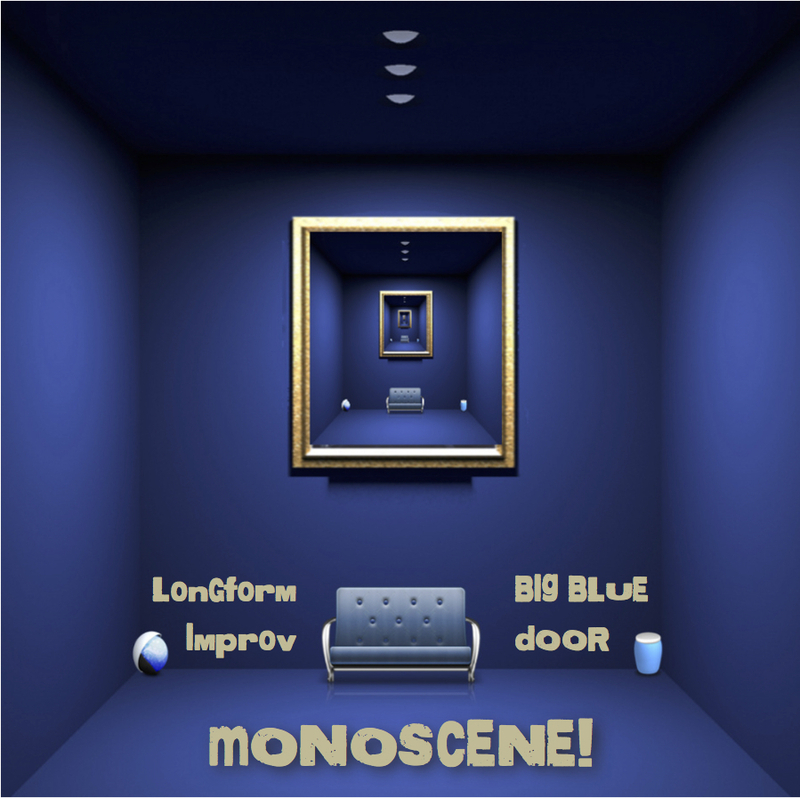 BIG BLUE DOOR IMPROV NIGHT: MONOSCENE! Big Blue Door resident improvisers open our spring improv run with a form called Monoscene, creating scenes inspired by audience suggestions of locations. 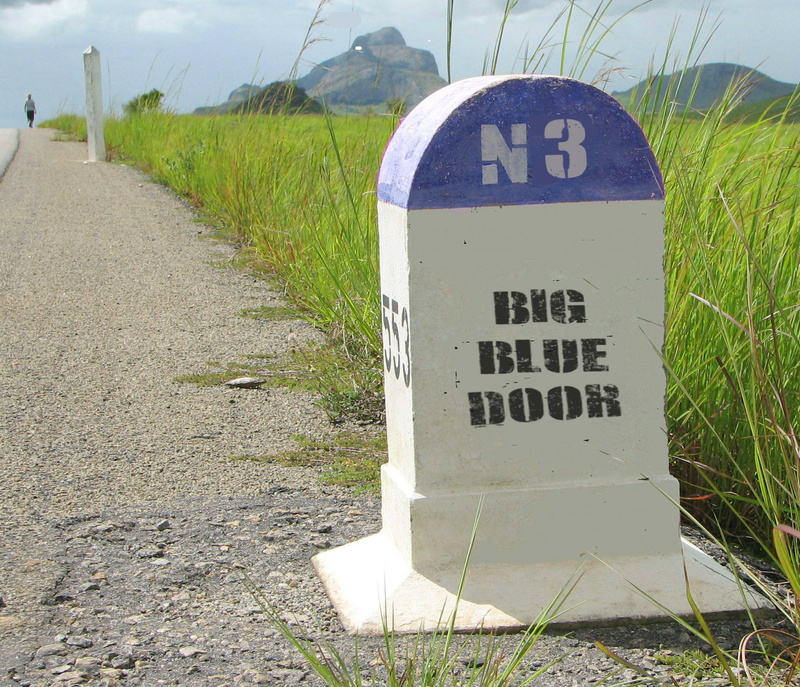 BIG BLUE DOOR TRIPLE IMPROV NIGHT!!! 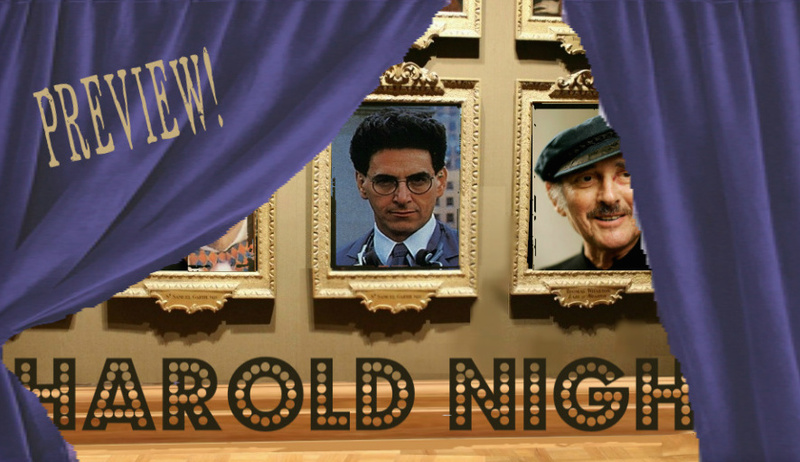 Improv I Class Showcase, Improv II Class Showcase, & Harold Night! $5 FOR ANY AND ALL SHOWS! Big Blue Door resident teams, Hotdog Water & Unusual Suspects, perform The Harold. Big Blue Door resident teams, Hotdog Water & Unusual Suspects, hit the road to perform The Harold in Crozet. Joel, I am confused about THE ECHO date. May 1 is a Sunday. Am I reading it wrong? Yes, it is a Sunday show! Time is still TBD!